Disney Cruise Line vacations are as close as you can get to an all-inclusive Disney vacation. 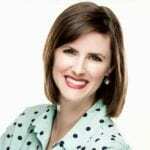 So how do you know which itinerary to choose? What about the ship? Disney Cruise Line’s first ship, the Disney Magic, is the oldest and smallest. 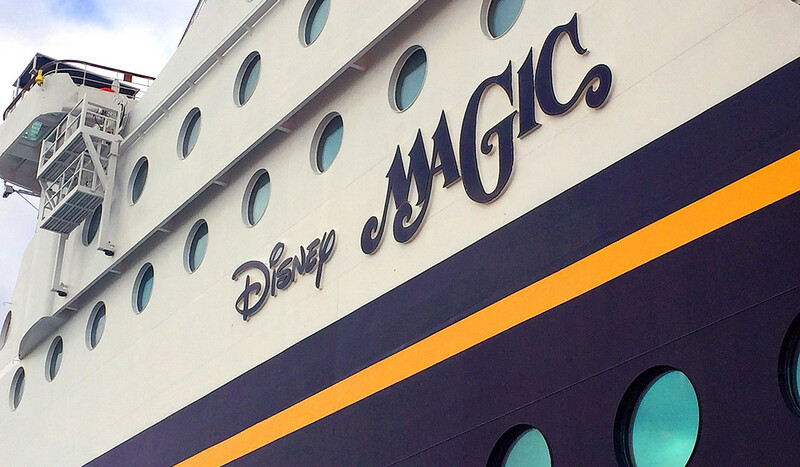 Find out why this TravelingMom and her family specifically chose to sail onboard the Magic. Disney Cruise Line currently operates four cruise ships: the Fantasy, Wonder, Dream, and Magic. Three new ships will be added, one each in 2021, 2022, and 2023. The Disney Magic is the fleet’s oldest ship, beginning its maiden voyage in July of 1998. Just because the Magic is the oldest ship, doesn’t mean it’s the least fun. In fact, my family specifically chose to sail on the Magic for very specific reasons. Weighing in at 83,338 gross tons and measuring 964 feet long by 106 feet wide, the Disney Magic cruise ship is also the smallest in the fleet. I, personally, love this feature of the ship. While mega-ships look great and have more amenities, I would be worn out just walking from one place to another! Additionally, the Disney Magic has 875 staterooms whereas the Fantasy and Dream have 1,250 staterooms. More staterooms equals more people, and that’s not always a plus in my book. Disney Cruise Line pioneered the rotational dining concept, and our family loved eating in a new place every night. 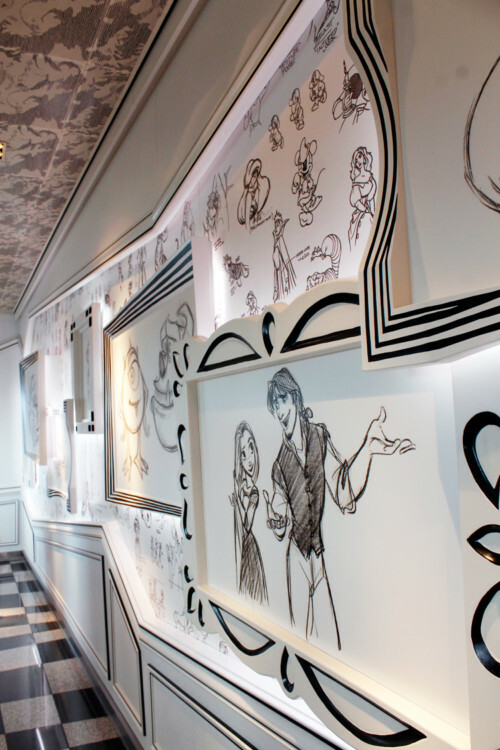 On the Magic, you’ll get to experience Animator’s Palate, Cariocas, and Lumiere’s. Each dining experience is expertly Disney themed and provides the ability to branch out and try new things! Our short, three day cruise gave us just a taste of what it’s like to cruise with Disney Cruise Lines. My family chose a short cruise because it was more budget friendly, but the Magic does have longer sailings. Three to four night cruises typically sail to the Bahamas or Caribbean, and they often include a stop at Disney’s private island, Castaway Cay (pronounced “key”). The Magic has also sailed to Alaska, Northern Europe, New England, and Canada. Most tropical cruises sail from Port Canaveral, Florida, but the Magic has also called New York, Galveston, Los Angeles, Barcelona, and London home. 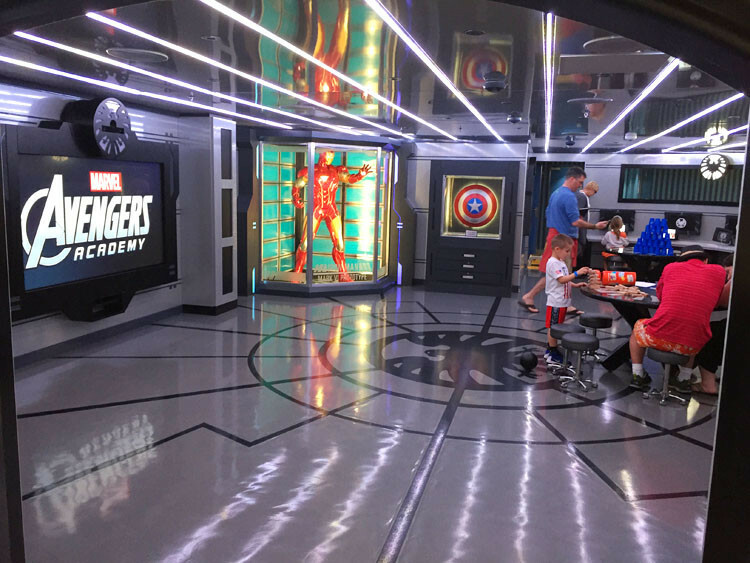 The key reason we chose to sail with the Disney Magic was the addition of Marvel’s Avengers Academy to the Oceaneer Club. One of my twins is a HUGE fan of Marvel characters, and, right now, we cannot meet them in any Walt Disney World park. Disneyland is quite a hike for us, so the Disney Magic was going to be our best bet. What if your kids are not fans of Marvel characters? No worries, there are lots of other great choices for activities in the Oceaneer Club and Oceaneer Lab. Teens and tweens can check out the cool Edge (ages 11-14) and Vibe (15+) areas that have activities and entertainment geared to their age groups. Of course, you may find it difficult to drag your kids away from the amazing pools and splash pads on board too! With all this talk of characters and kids’ clubs, the adults may worry there is nothing for them. Fear not! The Disney Magic has a lot of great amenities for adults. Palo, the adults only restaurant on the ship, features an extensive menu of fine cuisine. Italian fare and incredible views of the sea sound like the perfect evening to me! My husband and I really enjoyed the Quiet Cove Pool, which is reserved for ages 18+. Featuring two whirlpool spas, a pool, plenty of deck chairs, and a dedicated bar, Quiet Cove Pool is the perfect spot to relax and unwind. Further unwinding can occur in any one of the three lounges that caters exclusively to adults. Fathoms, Keys and O’Gill’s Pub are perfect for adults looking for a late-night party or relaxing nightcap while out at sea. Finally, we chose to sail on the Disney Magic because our cruise was a family cruise. Not just our immediate family, but a multi-generational one at that! Disney Cruise Line has amazing amenities for guests of all ages. It’s vital to check the daily Navigator (available both in paper version and on the Disney Cruise Line app) to see all of the available activities for the day. My family’s favorite spots were the Goofy Pool, Buena Vista Theater, and the Walt Disney Theater. In the Buena Vista Theater, we were able to see first run Disney movies like “Star Wars: The Force Awakens.” The Walt Disney Theater is home to spectacular live shows like “Tangled: The Musical,” which was one of the best Broadway-style shows I had ever seen! 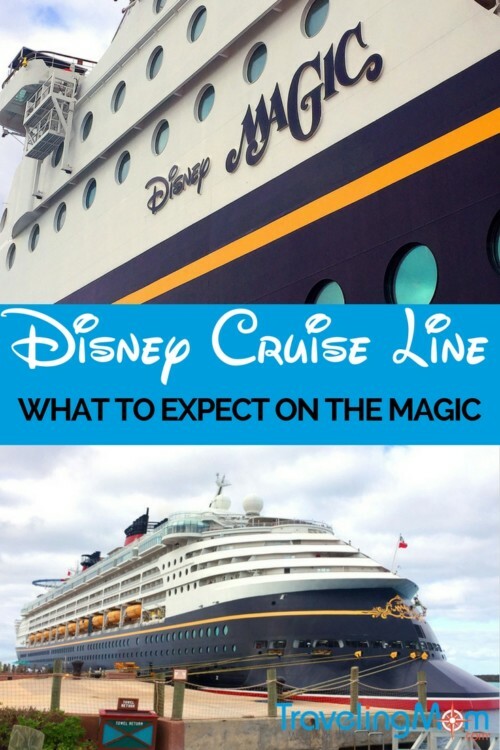 Because this was our first Disney Cruise, we had high levels of expectation for our experience. 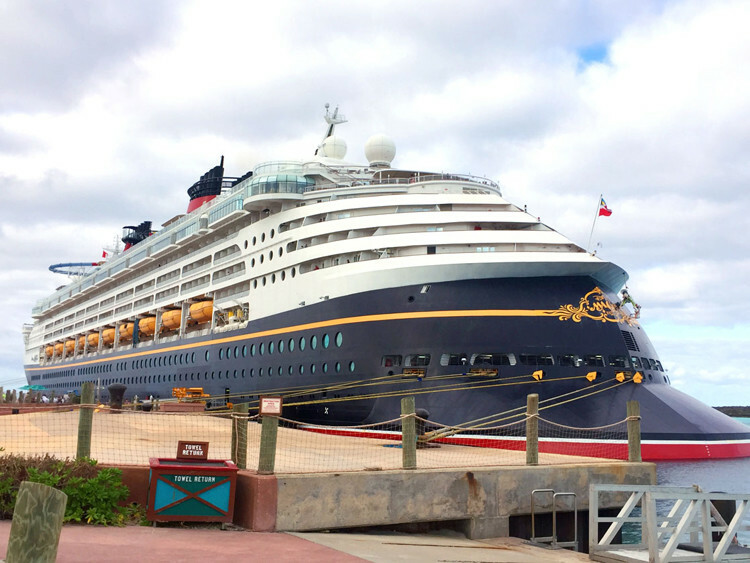 From embarkation to debarkation, we were constantly impressed with the quality of service and attention to detail we’ve come to expect from Disney vacations. Special touches like character meet and greets and the Pirates in the Caribbean deck party made our travel unique and fun. If you’re looking for a Disney ship to sail on, my family would not hesitate to recommend the Magic!